When Charles B. J. Snyder was appointed Superintendent of School Buildings—a title equivalent to official school building architect—in 1891, he had a busy career ahead of him. Within three years the Compulsory Education Law of 1894 would be put into effect, mandating that all children were required to receiving schooling until at least the age of 14. Coupled with this, the city was expanding at such a rate that the Board of Education was playing an impossible game of catch-up in terms of providing schools. On June 20, 1890, just months before Snyder would receive his position, the Journal of the Proceedings of the New York Board of Estimate and Apportionment noted the sum of $27,000 for the purchase of land “for school purposes” for four new schools. One of the lots adjoined the site of the school to the east and extending to West End Avenue. Although the old school would not be fully demolished until 1894, Snyder went to work on a new, commodious and up-do-date structure. At the time there was a resurgent interest in the Dutch roots of New York City and Flemish Revival architecture sprang up across the city. Nowhere did the style catch on as it did in the Upper West Side. By the turn of the century churches and row houses sporting stepped gables and Dutch motifs would dot the area. Snyder turned to this fashionable style for the new school. C. B. J. Snyder produced highly-attractive school buildings; but his attention was equally focused on modern hygiene, safety issues like fire protection, and ample ventilation and light. A mechanical and architectural engineer, he was responsible for the “H-Plan” of school construction that increased the number of windows and fresh air. The architect provided extra-large windows to allow daylight into the classrooms, but also provided both electric and gas lighting. To address the threat of fire he employed steel beams and hollow terra cotta block-and-cement floors, iron-and-slate enclosed staircases and hollow-brick partitions. To facilitate cleaning, interior walls were lined with glazed brick and tile. The Tribune noted that construction was expected to be completed by Fall of 1895. “The building will be built of limestone and Tiffany brick, and it will be made absolutely fireproof throughout,” said the article, adding that the cost would amount to $173,000. Snyder’s completed structure was handsome and imposing. Sitting on a rough-cut stone foundation above the sidewalk, the limestone-trimmed brick building rose to dramatic stepped gables and high chimneys. The main entrance on 82nd Street was sheltered by a decorative stone Tudor-style porch. The newspaper commended the range of facilities. “On the top floor are large gymnasiums, a commodious and well-equipped kitchen, where instruction is given in cooking, and rooms to accommodate a large school library. There are also rooms for clay modeling etc.” In addition to arithmetic, reading and the other expected areas of education, The Times noted that children were instructed in sewing, cooking and music. 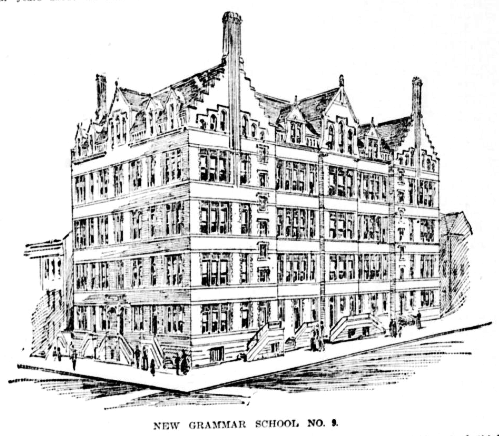 When New York City public schools were consolidated Grammar School No. 9 became Public School 9. Among the straight lines of silent pupils marching to class (absolute quiet was demanded in the hallways) in the 1930s was the future pop artist Roy Lichtenstein. The school served hundreds of children in the neighborhood each school year for a century, teaching them penmanship, grammar, citizenship and civics. Here young minds learned to diagram a sentence, memorize Longfellow, and to appreciate music. A student decades later would remember that cooking class meant making rudimentary food like toast or Rice-Krispies treats and sewing classes produced pot holders and aprons. As the demographics of the Upper West Side changed, the student body was noticeably infused with Puerto Rican children at mid-century. And while the school building remained unchanging, its name went through several transformations. In 1916 it was designated the John Jasper School (as well as Public School 9) after the recently-deceased former principal. In 1965 it was renumbered Public School 148 and called the Peter Cooper School. Before long it would be the Livingston School and in 2002 was re-named the Mickey Mantle School in honor of the great Yankee baseball player. Unlike most of the aging school structures, P.S. 9 survived totally intact into the 21st century. Today the Mickey Mantle School (Public School 811M) serves severely disabled students. Individualized attention is given to children with multiple disorders, autism, severe language or communication problems, or deep emotional or behavioral needs. Charles Snyder’s impressive Flemish Revival school was listed on the National Register of Historic Places in 1987 and designated a New York City landmark in 2009. 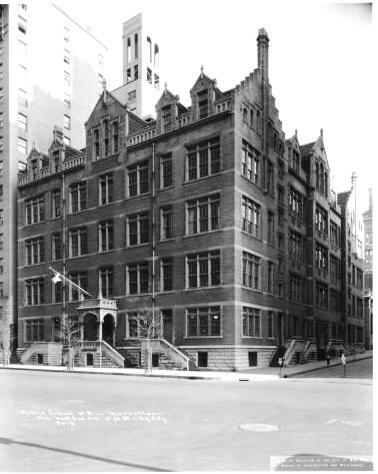 Charles Snyder is indeed responsible for most of the incredible turn of the twentieth century school buildings in NYC. Most are landmark worthy structures, elaborately detailed and well constructed and he introduced the "H" plan to many school layouts so that every classroom had great ventilation and light. All had advanced bathroom facilities, large rooftop play areas, in fact the schools were better environments for the students than most of the cramped and outdated tenements they called home. I went to kindergarten in that school building in 1959. It was a beautiful building.